Before the 10th of April, every picture you have ever seen of a black hole has been a rendering. Earlier this week, scientists were able to finally capture the real thing: a black hole in a galaxy called Messier 87. Scientists have long predicted the existence of black holes. A body of such high density that even light could not escape it was theorised as early as 1784 by John Michell. However, it wasn’t until 1915 that the theory began to gain speed. Albert Einstein published his theory of general relativity, which rightly concluded that light was influenced by gravity. Other physicists in the following decades began solving Einstein’s equations, and peculiar behaviours began to appear in some of the mathematical solutions (such as an object whose gravitational field was so strong that not even light could escape its pull). Since then, physicists have followed the breadcrumbs of black holes. Experimental observations such as the orbit of stars and, more recently, the gravitational waves emitted from the merger of two black holes have been recorded as evidence. This year, scientists have finally captured the mugshot. Previously, images of black holes have been difficult to observe as they have been either too small or too far away. Since black holes do not emit light themselves, we need to capture the light around them. Black holes are composed of an event horizon (a boundary beyond which no light can escape), and the accretion disk that surrounds it in a halo. This accretion disk is made of gas and dust that orbit the hole at such a velocity that the particles heat up and emit high energy x-ray and gamma rays as they collide. This light has to travel to Earth through light years of obstructions in space before finally penetrating our planet’s atmosphere. Since the Earth’s atmosphere is relatively opaque to most wavelengths of light, scientists were forced to detect a specific window: 1.3mm radio waves. NASA coordinated eight ground-based radio telescopes, which together are referred to as the Event Horizon Telescope array (EHT). Four of the dishes were in North America, two in South America, one in the South Pole, and the last two in Europe. The astronomers used a technique known as Very Long Baseline Interferometry. Researchers can emulate a huge radio dish with a diameter equal to the distance between a pair of smaller telescopes. The two dishes take readings simultaneously so they observe the same radio signal, all while correcting for factors such as atmospheric noise and calibration. At every one of the eight locations of the EHT is an atomic clock that enables its operators to keep time to precisions of a few attoseconds (10-18s). After this data is collected, it is pieced together using algorithms into one cohesive image. To ensure accuracy, the data was given to four independent teams which used different techniques to generate an image. These four teams were led by Katie Bouman, Andrew Chael, Kazu Akiyama, Michael Johnson, and Jose Gomez. Once all four teams arrived at very similar end results, their images were “sewn together” with an algorithm made by Mareki Honma that filled in all the missing pixels by analysing the ones that surrounded it. Katie Bouman has since become a viral sensation for her valuable contributions to the project. Specifically, she was key in developing an algorithm known as Continuous High-resolution Image Reconstruction using Patch priors (CHIRP). CHIRP helped sort through the huge amount of data obtained from EHT so that only the black hole-relevant observations would be included to generate an image. 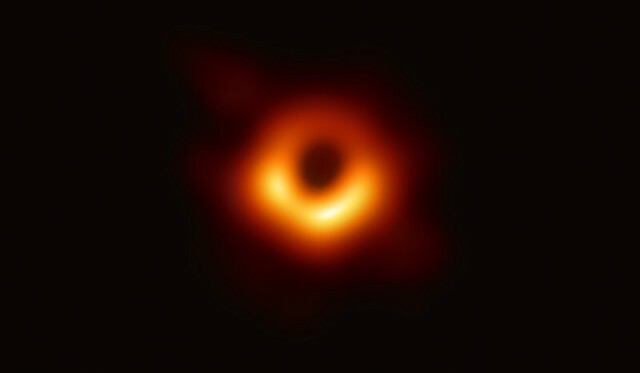 The black hole image is not only a technological triumph, but one that would not have been possible without the teamwork and dedication of international groups of scientists. Being able to directly observe a black hole will be integral in understanding the nature of our universe and how it continues to evolve.